Our students love the life and the environment that we offer so much that they are looking for excuses to come right back to us. We have a good number of alumni who work with prestigious companies all over the world, who make our institution proud. 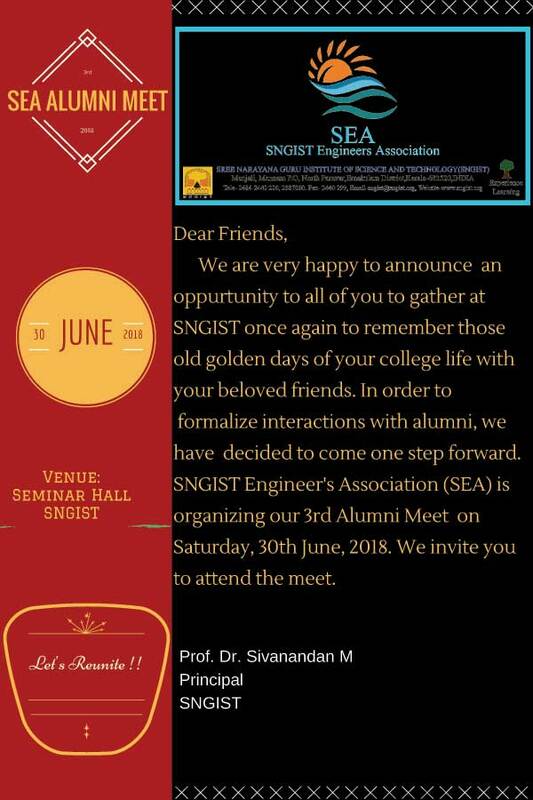 SNGIST Alumni Association was formed by the old students of the SNGIST in order to retain their bonding with the alma mater and to connect with their classmates. The main idea behind this is to remain in close contact with the alumni mutually benefiting each other. All the out-going students are given membership through registration into the alumni association as the members by duly filling up the registration form. The annual alumni get-together, enable all of them to refresh the memories of their college days and to give back to their alma mater in all possible ways. They also get strengthened by their association with their alma mater and develop their career through such interactions. For the institution, the true worth of its activities, in the long run, is the success of its alumni. Every year we conduct the alumni meet at SNGIST campus. We also have various alumni chapter in other countries. The above mentioned contribution by the alumni is benefiting the institution in strengthening its co-curricular activities and the students are benefited in multiple dimensions.